A horse's conformation and structure can limit or expand his options as a performance horse. With poor conformation, a horse may be best suited to quiet trail rides. With good conformation, and that important factor of heart and athletic ability, horses are capable of exceptional athletic performance. Straightness and symmetry indicate overall fair front-end conformation for this horse. The slight knock-knee and left side toe-out could be improved. Start with straightness. When looking at a horse from the front with him standing quietly, the front legs should appear to be straight. If you draw a line down from the point of the shoulder, the leg should fall perfectly straight. Your line should go right through the middle of the knee (carpus) and continue right down through the middle of the pastern and hoof. This is the ideal. The average horse may deviate a bit from that straight line. A horse whose hooves point out to the side is "toes out" or "East/West." Depending on the degree, this is a minor fault, but the horse may clip his other foreleg as he moves. A horse whose hooves turn in has less likelihood of injuring himself, but moves inefficiently. Both conditions put abnormal strain on various tendons and ligaments. Some horses will have a deviation from the straight line starting higher up the leg. A horse with an offset knee is described as having a "bench knee." In this case, his leg is straight through the forearm, but the knee is slightly offset to the inside. The cannon bone comes off the knee slightly offset to the outside. This is a minor problem in many horses (including racehorses), but will limit the career of others. Note the straight lines, as well as the angle of the pasterns relative to the hoof. If you now move to the side, the front leg should again travel straight down to the ground in the middle of the leg, but the line you draw will end just behind the heel due to the angle of the pastern. Common problems here can be "calf kneed" or "back at the knee," with the carpus falling behind the ideal straight line. A "sprung or bucked knee" is the opposite problem, with a knee that buckles to the front of that imaginary line. Both are faults that can limit the athleticism of an individual horse. Also note the strong gaskin. Leg geometry should be matched with adequate muscle. When looking from the side, you should also look at the pastern angles. Too straight is a fault as is too sloping. Angles of 45 degrees for the front pastern and hoof and 50 to 55 degrees for the rear pastern and hoof have been used as guidelines for many years. It is important to realize that this is an "ideal" and may not be correct for a specific horse. The best angle will vary with the conformation of the entire leg. Many horsemen now feel that 47 to 55 degree angles in front and 49 to 59 degree angles in the rear are more correct. 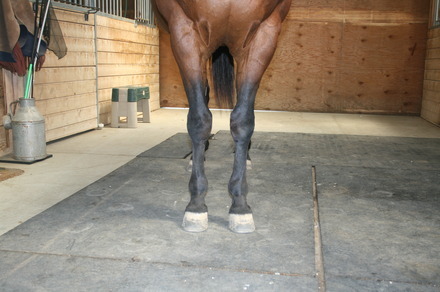 It is important that the hoof and pastern angles match after trimming/shoeing. Now move to the rear legs. Looking from directly behind your horse, you should be able to draw another straight line - this time from the point of the buttocks down through the hocks and along the cannon bone to the hoof. Many horses will have slight deviations from this perfect plumb line. Looking from the side, a line from the point of the buttocks should pass right along the rear of the hock and follow the cannon bone straight down. 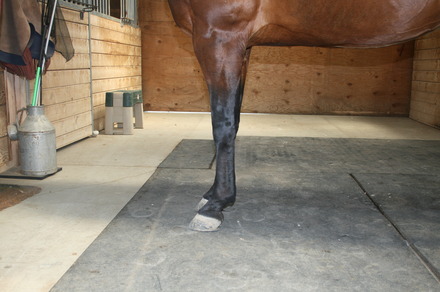 It will continue to the ground after the fetlock (and drop to the heel bulbs like in the front). Common defects seen from the rear view include "cow hocks" with the hocks turning slightly inward and the hooves facing slightly outward. This defect can be seen in many Western performance horses - a slight degree does not usually interfere with work. Being "bowlegged," with hocks bulging outwards is the opposite defect. From the side, a horse may be too straight through the hock. This is called "post legged." 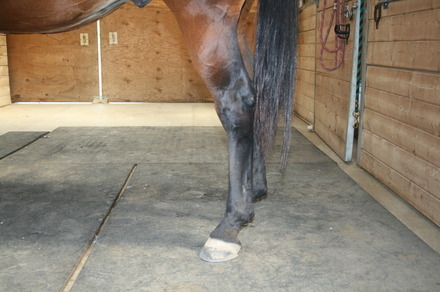 Other horses have too much angle in the hock area and have "sickle hocks." Both of these defects represent weaknesses. The degree of the defect influences the possible working limits of the individual horse. These general descriptions of equine leg conformation don't really tell you how well the horse can or will work. Obviously, slight deviations from the ideal mean less likelihood of the horse breaking down. Still, even horses with fairly significant defects may overcome them via conditioning, training, or simply the will and heart to work. Seabiscuit is often cited as an example of this. He was considered to be scrawny and by all accounts had obvious bucked or sprung knees. Theoretically, those faults should have made him a bust at the racetrack. Instead he had a very successful career. 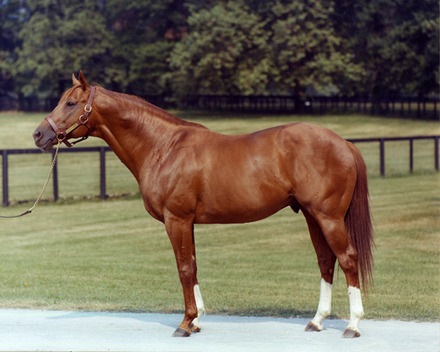 Secretariat, winner of the Triple Crown in 1973, is considered by many to exhibit near perfect leg conformation. Secretariat is often touted as having exquisite conformation. His conformation did hold up well and his success on the track can certainly be at least partially attributed to his excellent structure. 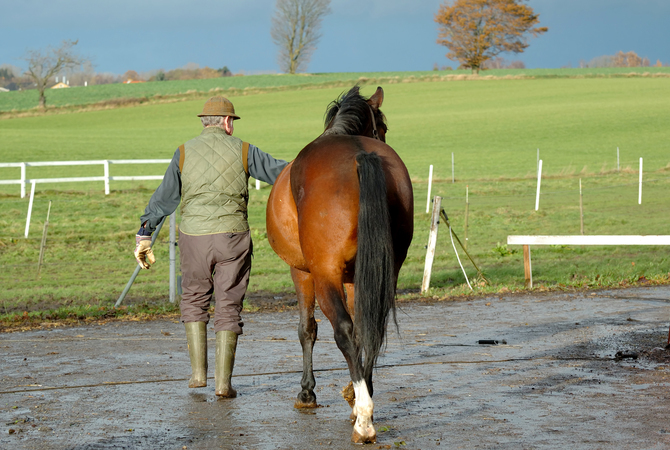 Beyond deviations, it is also important to look at the work your horse will be doing. The ideal conformation for an endurance horse is different from a reining horse. There are conformation points (beyond the basic straight leg ones) that can make a horse better suited for one event or another. A top Western pleasure prospect can get by with slightly straighter angles. He will be working at slow gaits without a lot of "action." The average reining horse may be a touched cow hocked. This can even help with the quick "sit down" stops required for that work. Mild cow hocks don't tend to cause problems for most endurance horses either. More significant for virtually any equine task is balance. Overall balance is important for most equine work. A horse with very light bone but lots of muscle is more likely to break down than a horse with balanced bone and muscle. The angles of the shoulder, hip, and pasterns should all be similar in a well-balanced horse. From racehorse to pleasure riding horse to driving horse, balance is a desirable quality. Don't use pictures to judge a horse's conformation. Horses with poor conformation can be made to look good in photos through handler manipulation. Conversely, a horse with great conformation may appear poor in photos due to the photographer's lack of knowledge. To truly judge a horse's conformation, the horse should be walked into position naturally and observed in person! Stepping back and looking at a horse from a slight distance is the best way to judge balance. While hard to describe, the look of a balanced horse is unmistakable. The whole appearance of the horse will tend to flow together. It won't matter what angle you look from. When a balanced horse moves, you will see a nice symmetry in the movement, too. Evaluate the finer points of conformation but don't forget to look at the overall picture and the intended function of the horse as well. Conformation relates to soundness, and is the ultimate goal of a horse breeder. Learn more about lameness that can result from poor conformation in our Lameness Health Center.